Waiting its release since a decade, I actually watched the film in a 2017 film festival in Delhi and this was supposed to be the debut film of Farhan Akhtar as reported, who then made his first film appearance in ROCK ON (2008). THE FAKIR OF VENICE finally but questionably gets released in the times when people have already stopped visiting the theaters for such unknown or smaller films and like to watch them only on the online portals for a subscription at their own convenience. So the box office outcome of this dated release can be easily guessed. 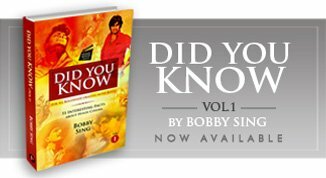 But there is one interesting feature of the film made in mixed Hindi-English language, directed by Anand Surapur and that is its subject which easily finds the connect even today and will probably remain fresh forever due to the age-old mystic picture of India in the minds of the western countries. 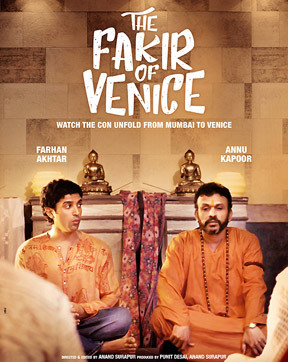 Featuring Farhan Akhtar and Annu Kapoor in the lead along with Kamal Siddu, it is about an Indian conman who takes a poor slum resident to Venice presenting him as a Fakir with an unheard of magical skill. And then it’s all about how they form a relationship successfully carrying out the deception in the foreign land. The subject no doubt has great potential of including both comedy as well as thoughtful sarcasm on the perception of India and Indians in the west. But the film sadly doesn’t turn out to be as enjoyable as it should have been thinking about the innovative storyline. As the key performer, Farhan Akhtar looks too rich in his onscreen persona, acts fine but doesn’t come up with anything extra-ordinary playing the trickster. On the other hand, Annu Kapoor remains interesting and engages you throughout as the big savior. The two begin quite well, but then are given to do the same old predictable things abroad as seen in several other films. Besides, the execution remains lousy and the screenplay fails to exploit the subject wasting a given opportunity with the film also looking a bit long even in the duration of just around 100 minutes. In short, this is yet another project that seems to have been made eyeing the foreign festival market in particular, presenting India as the land of mystics, magicians and snake charmers (as usual) along with an exciting plot. However the end-result is nothing great and the film is exactly like something you might partially enjoy watching online without spending any extra money, but visiting the theater for such dated, average and unexciting offering is strictly not suggested.